There is (or was) several reasonable quality models of various variants of Schuetzenpanzer Marder available in 1/35 scale: Tamiya offered standard Marder 1 and later also Marder 1A2. Revell made their own kit of Marder 1A3. None of these kits was perfect, but it was possible to build nice models of them. The worst parts of all these kits were tracks. 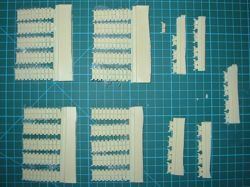 In Tamiya models you get vinyl tracks of typical quality of their models from 70's. 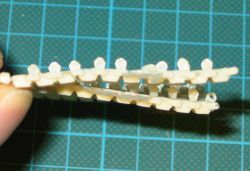 Tracks have basic details on both sides, but instead of the big "looped" guide horns there are small dual horns on each link (see photos below). 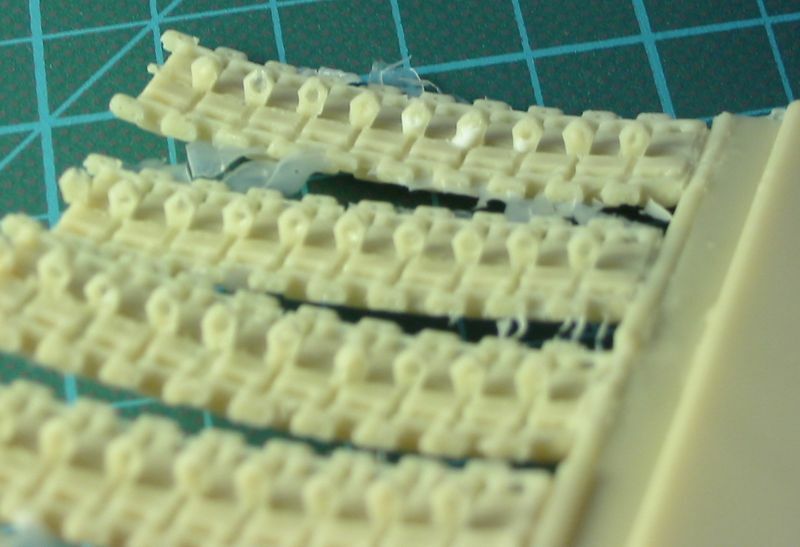 I don't have Revell kit and only saw it for a short moment some time ago, but I remember that tracks were made of unpleasantly soft vinyl and had solid trapezoid guide horns. These "looped" horns, so characteristic for Marder tracks, are impossible to reproduce in typical vinyl tracks. 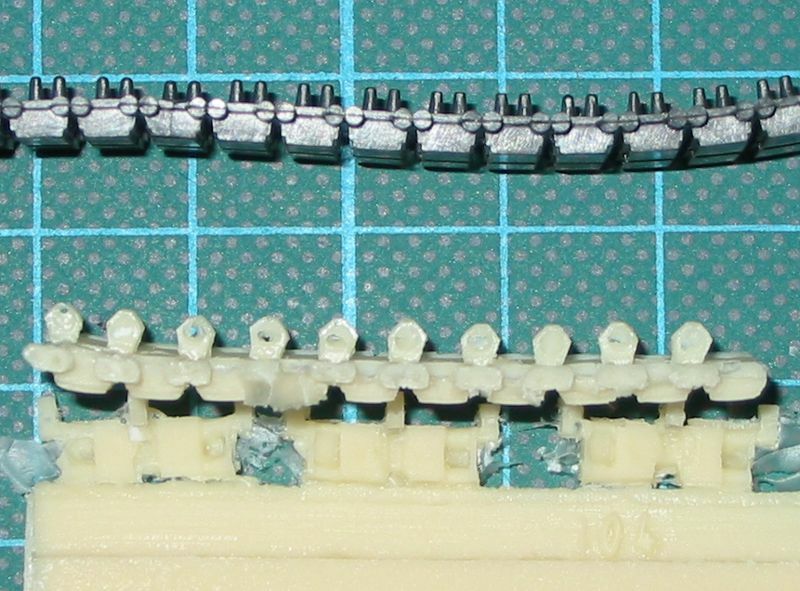 I imagine that they could only be made in plastic by separately molding each horn - but then it would be awful lot of work to assemble such tracks, particularly that horns on Marder tracks are not on link connectors, but on the middle of the link itself. 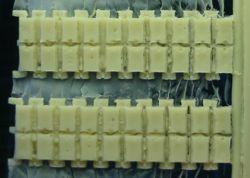 It is probably also possible to mold such tracks with "looped" horns in resin, but some resin film would inevitably be left in the middle of each horn and would have to be removed. 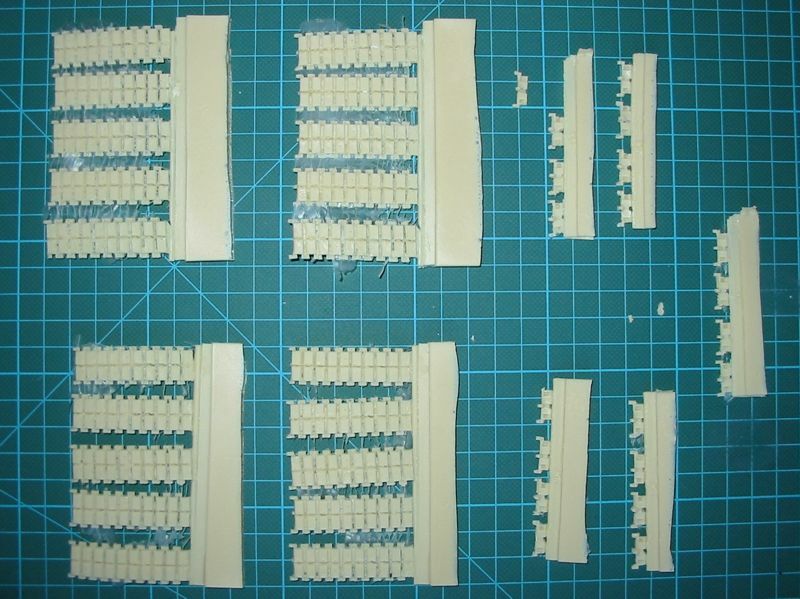 Some time ago Hong Kong Creation Workshop announced plans to release Marder tracks (as they already made Leopard 1 and 2 tracks, and Diehl tracks for M113), but later unfortunately abandoned this idea. 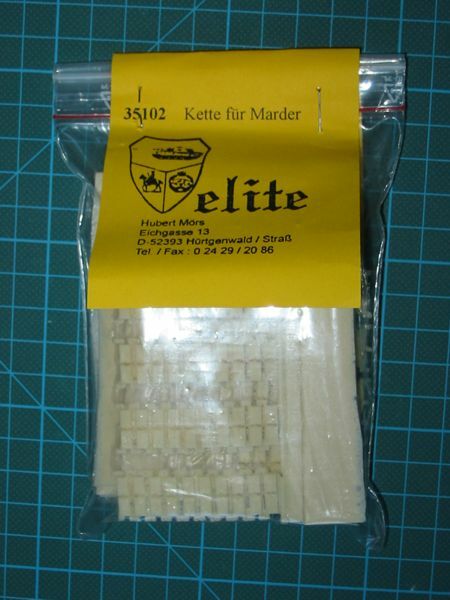 For a long time there were no aftermarket tracks for Marder available, but then several months ago I noticed that Elite Model decided to offer resin tracks from their all resin Marder 1A3 model as a separate product. From the few small pictures on Elite web page (http://www.elitemodell.de) it was clear that these tracks have "looped" horns! 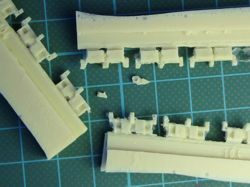 I didn't thought about it very long and placed an order for one set of these tracks immediately (17.75 Euro). Elite resin tracks set for Marder. I received the set quite quickly - there were some minor problems with the payment as Elite were not able to process MasterCard payment and I had to additionally provide my Visa card details, but once it was cleared I received the packet in a short time. The set arrived a small resealable plastic bag, full of resin (see the photo on top of the review). Actually the bag could be a bit bigger as the parts were very tightly packed inside. The contents of the bag is shown on the photo above. There are 20 sections of 10 links each and 20 separate links. In my set one separate link was loose and I also found some broken of pieces of resin inside the bag. There is more links in the set than is required for one Marder model, although it would be much better to have more individual links, or at least a few shorter sections than 10 links. 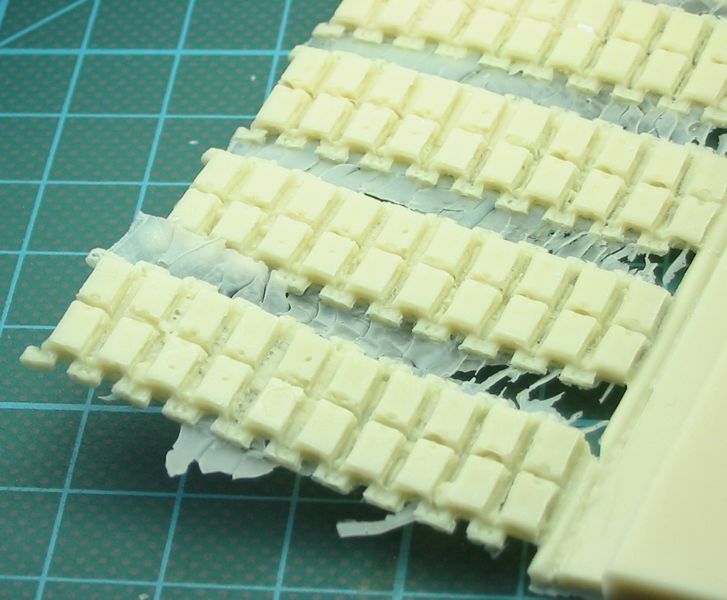 First I will concentrate on accuracy of the resin tracks. General dimensions of tracks almost match these of Tamiya vinyl tracks, so there should be no serious problem with fitting these tracks to Tamiya sprocket wheel. 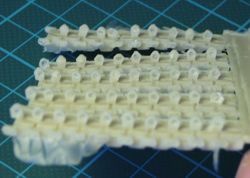 Below are two sets of photos that show the real Marder AFV tracks (photos taken from http://www.panzer-modell.de web site) and Tamiya and Elite tracks. On the left photo is the real Diehl track on Marder AFV. 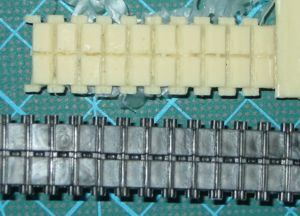 On the right are Elite resin tracks and Tamiya vinyl tracks. Click on the right picture to enlarge. On the right are Tamiya vinyl tracks and Elite resin tracks. The first set of photos reveals first accuracy problem of Elite tracks. 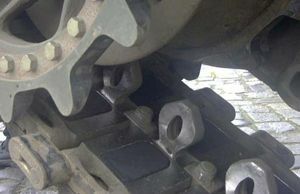 Links of real Marder tracks are joined with three connectors - two on the sides and one in the middle of the link. Tamiya vinyl tracks show this feature, although in a very simplified way and the space between rubber blocks is a bit too small. Elite tracks do not show the middle connector at all - rubber blocks are way too close to each other and between them is just some poorly defined mass of resin (better visible on other photos - see later in the review). 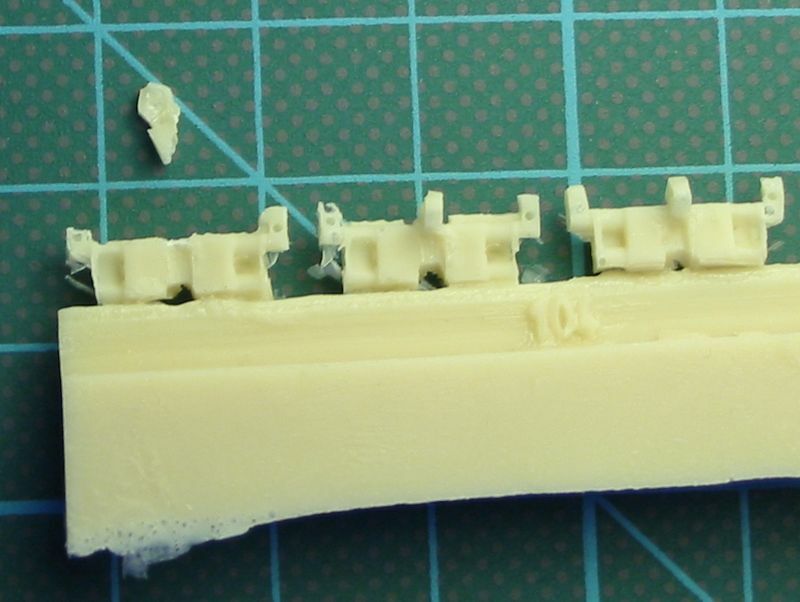 The second set of photos show the other accuracy error in Elite tracks. 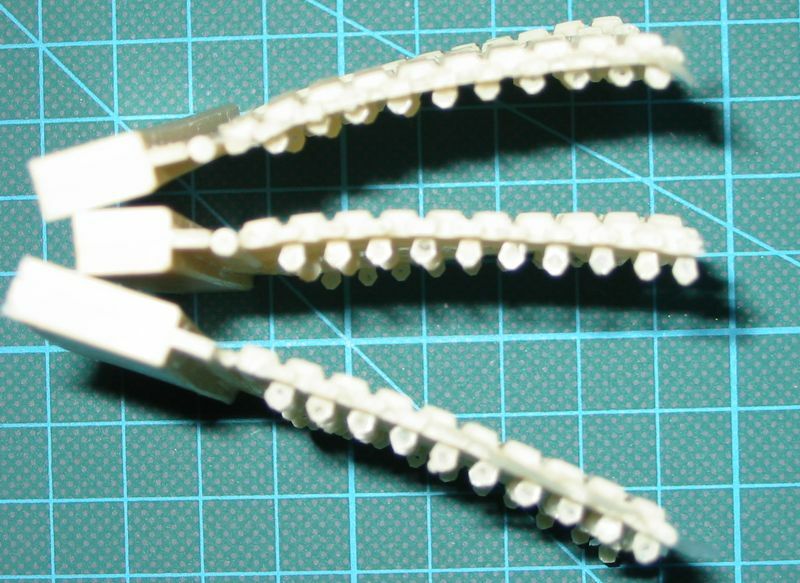 While they feature correct "looped" horns (with the excess resin inside them, but it was expected and unavoidable), the horns are located in line with the link connectors, while they should be on the middle of each link! Tamiya tracks have horns of completely incorrect shape, but at least they are in correct position. 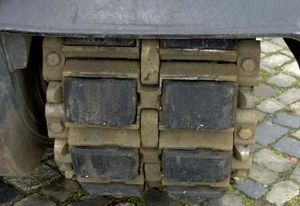 On the first photo of real Marder tracks above you may notice that rubber road blocks are flat and rectangular - with no indentations. 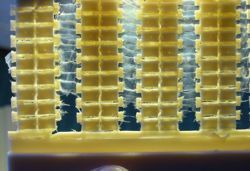 On the picture below you can see that Elite tracks have small indents on each block - near the middle of the link. 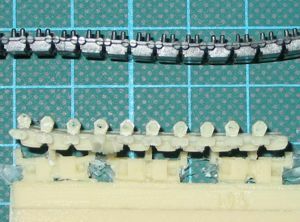 Leopard 1 tracks indeed have such indentations, but they are not correct for Marder tracks! 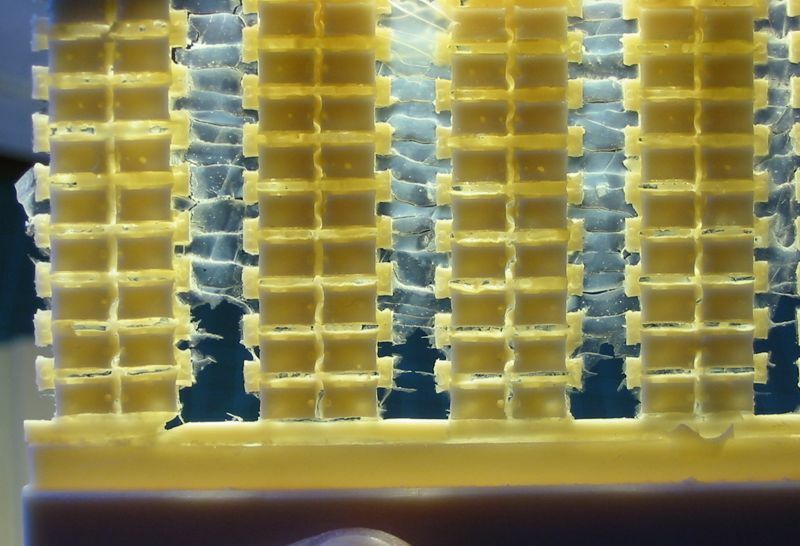 Note the indentations on rectangular road blocks. Now for the quality of molding... Well... I think I will not try to add many comments - photos below tell the whole story. 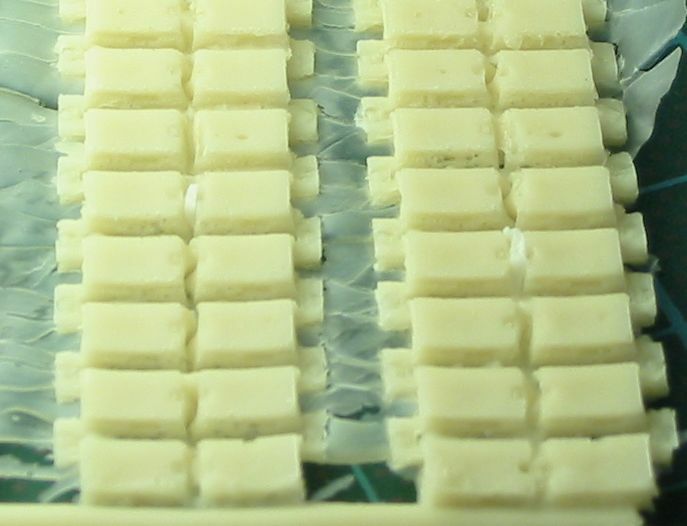 - probably only heating them to soften the resin can help. 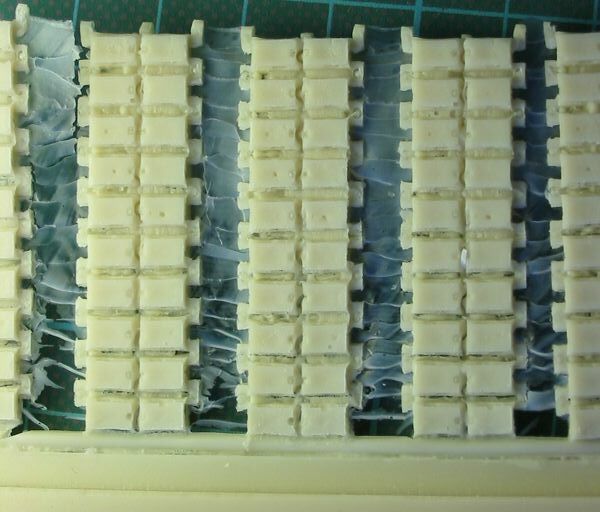 numerous air bubbles to fill. 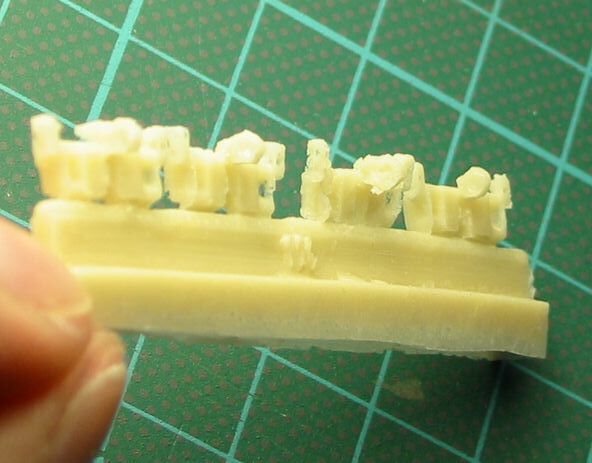 others were deformed or not fully molded. Horns have various shapes and sizes. 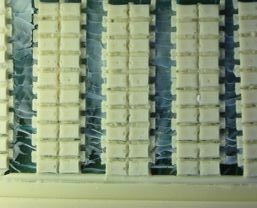 white silicone rubber mold that stuck to the parts. I have never seen any other Elite product, but the set reviewed here made me very cautious. I will never order anything from them, unless I see the product "in flesh" beforehand. 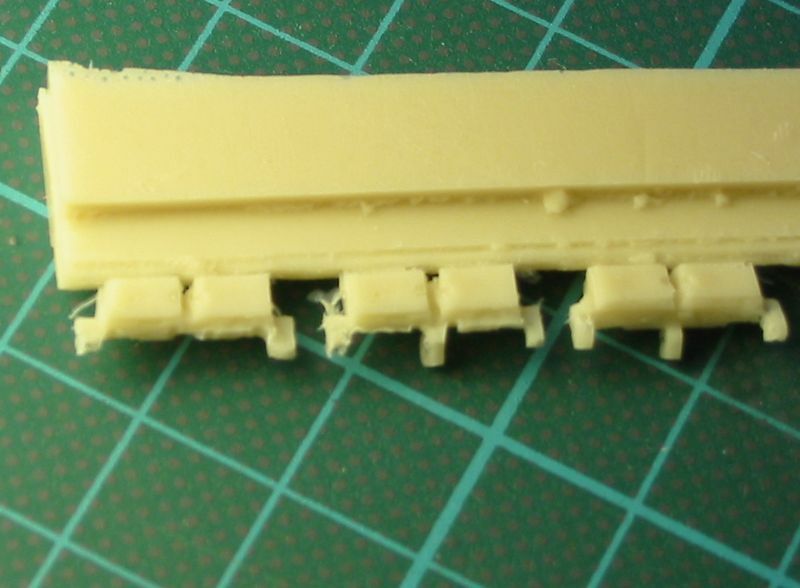 I think these Marder tracks may be in a way acceptable as a part of complete resin Marder kit, but as a replacement for Tamiya tracks, they are completely useless. I contacted Elite asking if I can get my money back. I received a reply (after almost six weeks, as unfortunately Elite owners started their vacations shortly after I ordered the tracks set) that they are unable to give me the money back, but offered me some other product from their offer if I send the Marder tracks back. Unfortunately there is nothing in their offer that I would be interested in, so I guess I will just keep the set as a "memento". If after reading this review you think you still want this set - let me know as I may be willing to part with it very cheaply.